U.S. Bellows, Inc. designed and fabricated 2 EPDM tied expansion joints for a construction company in Texas. These expansion joints have an inside diameter of 29”. 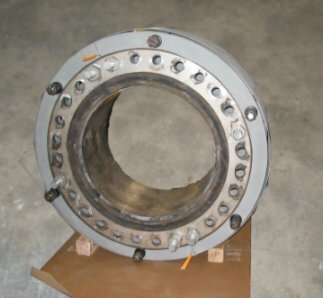 They are composed of A516 carbon steel grade 70 with a six-rod control assembly, EPDM, and plate flange. They were hydro-tested to 217 PSI. These joints were ordered on a one-week rush basis to replace an existing joint that was leaking. U.S. Bellows, Inc. designed and fabricated this refractory lined universal expansion joint for an FFC unit in India. 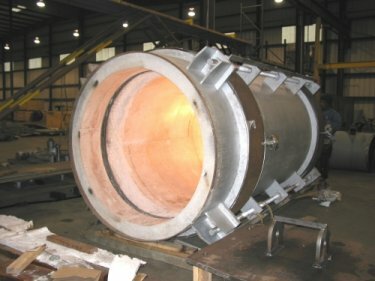 This is a 70″, outside diameter, tied refractory-lined universal expansion joint with two-ply Inconel® 625 LCF bellows, A516 weld ends and spool, and a 4″ thick refractory lining per UOP specifications. This joint was designed at 51 PSIG and 1400 degrees F. Bellows long seam welds were 100% x-rayed and 100% dye-penetrant before and after forming. It was also pneumatic tested at 57 PSIG. The refractory lining was dried out per UOP specifications.